Who we are and how we came to be in this beautiful place. Farewell Harbour Lodge is proudly owned and operated by the Brockway and McGrady families. Ryne Brockway and Tim McGrady both have long histories on the coast and in the tourism industry. Our business is truly a labour of love and involves our entire families including Ryne’s wife Rebecca, Tim’s wife Kelli and their two sons Connor and Kai. Ryne has been avidly fishing the local Broughton Archipelago and Knight Inlet waters for 20 years and 6 years ago decided to launch his own tourism business, founding Bones Bay Lodge just a stone’s throw from Farewell Harbour. Bones Bay Lodge grew rapidly driven by Ryne’s passion and his outstanding hospitality and commitment to excellence. Although small, Bones Bay Lodge had developed a reputation for excellence in the industry and its wildlife program was awarded the coveted designation as a Canadian Signature Experience. Ryne was looking to expand his rapidly growing business when he was introduced to Tim by one of our mutual travel trade partners. 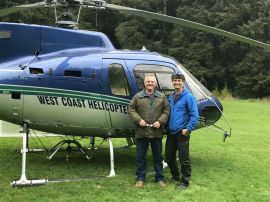 Tim and Ryne developed an instant friendship, both fuelled by a relentless commitment to quality, a passion for the wild places of the Broughton Islands area and Great Bear Rainforest and a desire to own and operate a first class wilderness lodge. After literally exploring the entire BC coast, Tim and Ryne settled on nearby Farewell Harbour as the perfect spot to expand on Ryne’s business and continue building on that original success of Bones Bay Lodge. Farewell Harbour possessed all the qualities we were looking for - access to amazing wildlife, true wilderness character, relative ease of access, a protected anchorage and a beautiful west-coast inspired land-based lodge facility. In the winter of 2016 we relocated Ryne’s floating Bones Bay Lodge to Farewell Harbour, attached it to the land-based lodge with a series of interconnected walkways and ramps and rebranded as Farewell Harbour Lodge offering the perfect combination of land-based and floating accommodation. Join us for an Adventure of a Lifetime!